Learn to create a Genius Playlist and break free from your musical rut. For most creatives, music is inextricably intertwined with the creative process. Before we sit down to hammer out a project, many of us pick a playlist that (we hope) will inspire or, at the very least, keep us awake. 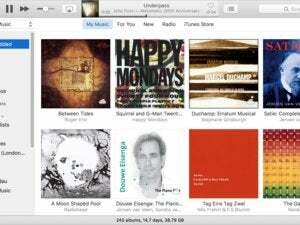 Steve Jobs, in delivering keynotes on iTunes and the iPod, called music “the soundtrack of our lives” and trumpeted iTunes’ Genius Playlists as a shockingly easy way to discover (or rediscover) music in our collections—after all, many of us own more music than we remember to listen to. In this column, you’ll learn to create a Genius Playlist and break free from your musical rut. By far the easiest and most enjoyable way to get started with Genius Playlists is to start with a song you really love. You know, one that brings a smile to your face and sensory memories of a happy time in your life. The genre—metal, rock, pop, classical, jazz, etc.—matters not. 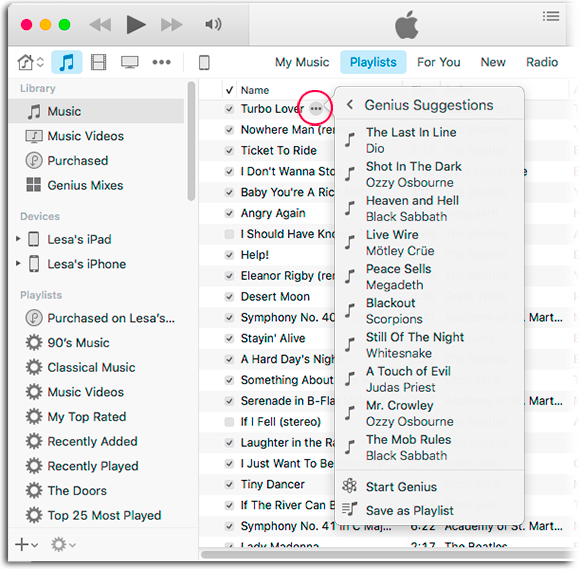 Don’t panic if your mind goes blank; iTunes can show you the songs you play the most. To see them, click the Music icon at upper left, click the Playlists button toward the top of the window and from the menu at far right, choose Songs. One of the columns of data that appears should be Plays (you may need to scroll horizontally to see it—you can move it to a more convenient location by Command-dragging it leftward). If it’s missing, you can add it by Control-clicking (or right-clicking) anywhere in the row of column headers and choosing Plays from the resulting menu. 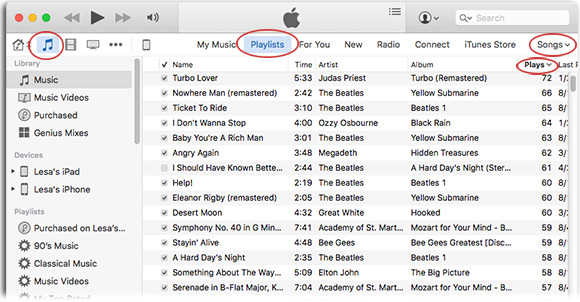 Now click the Plays column header and iTunes sorts your songs by how many times they’ve been played. It’s a good bet your favorite songs will be near the top of the Plays column. Back in the main iTunes window, click the song name to highlight it (it’ll turn blue), Control-click or right-click the song name and choose Create Genius Playlist from the resulting menu. 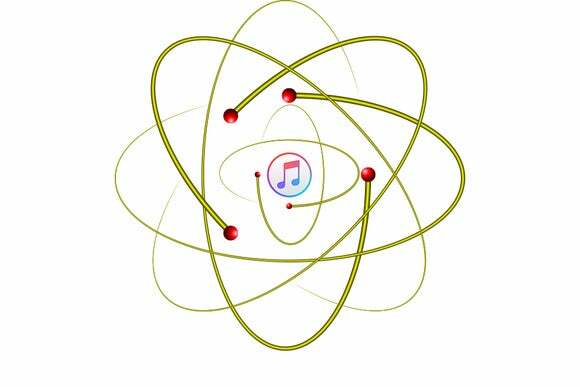 When you do, a new Genius Playlist appears in the left panel, marked by an atomic symbol and named with your seed song. 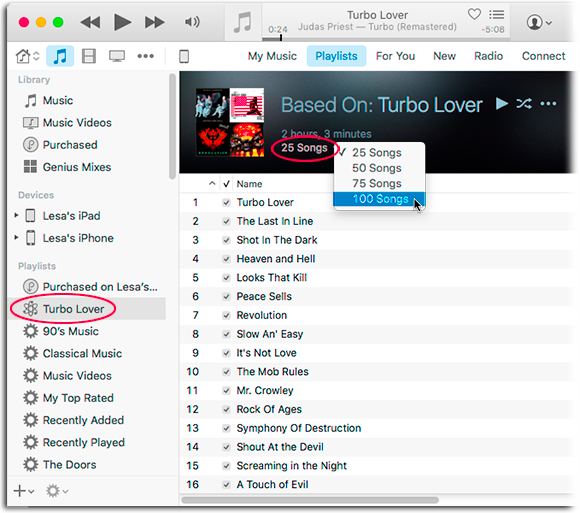 At first iTunes include 25 songs, though you can add more by clicking the text 25 Songs next to the album art and picking 50, 75, or 100 from the menu that appears. When you’re satisfied with the length of your new playlist, you can peruse the songs that iTunes picked and eliminate any you don’t like. Simply click to highlight the song and press the Delete key on your keyboard. This removes the song from the playlist, but not from iTunes. To rearrange the order of songs, click and drag them up or down in the playlist. You can leave your Genius Playlist alone now and enjoy it henceforth, or you can expand your music exploration a bit further. One way is to create a regular playlist from the content of the Genius Playlist and then manually add other songs. To do that, press Command-A to select all the songs in the Genius Playlist, then choose File > New Playlist from Selection. This also gives you an opportunity to name the playlist whatever you like. Then, as you discover another favorite song, you can use the techniques above to generate another Genius Playlist and add some or all of its songs to the regular playlist you recently made. So you see, creating a Genius Playlist based on a favorite song is really simple and the joy you can experience by letting iTunes gather songs that sound great with it is huge. After all, that Genius Playlist may propel you through your next big project! Until next time, may the creative force be with you all.